Major Millions is one of teh most popular progressive slots online and now there are two ways to play. You can play the original three reel game or this version which has 15 lines and the same 3.00 maximum bet and progressive jackpot. 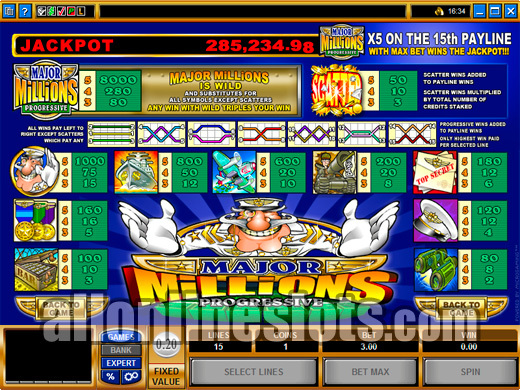 The original 3 reel, 3 line version of Major Millions was the first online game to break the $1,000,000 jackpot mark. Now you have two ways to go for the same life changing jackpot with the introduction of the Major Millions video slot. Found at all MIcrogaming casinos the game offers a base level jackpot of $250,000 and has gone over $1,000,000 on quite a few occasions. This version has 5 reels and a big 15 lines. It has a fixed coin size of 20¢ and max bet is 15 coins. This makes the max bet on this version and on the three reel version the same $3 bet. While the games do share the same top jackpot the mid range pays are all very different. 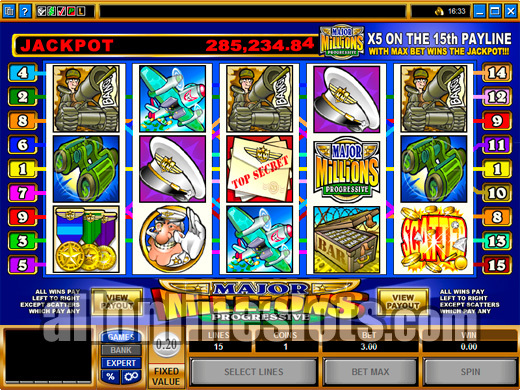 The Major Million video slot has a total of 33 winning combinations. This is 20 more than the three reel version. The biggest difference is the size of the wins. On this version the second highest pay is 8,000 coins ($1,600) while on the three reel version the second highest win is $50,000. Of course with a lot of smaller wins the video slot version has a much higher hit rate. The Major Millions logo is the most important symbol in the game. Firstly it is wild and acts like a joker for all other symbols except scatters. Secondly, any win with a wild logo as part of the combination is tripled. And finally the Major Millions logo is your ticket to the progressive jackpot. Line up five Major Millions symbols on the 15th line with max bet played and you are the latest mega online jackpot winner. The same combination on lines 1 to 14 pays 8,000 coins. While the two versions of the game look and play quite differently it is worth noting that the odds of winning the jackpot are the same. It makes no difference if you play the three reel or the 5 reel version. In the end it comes down to the type of slots you like to play. If you are a video slot fan then go for the jackpot on this version. A classic slot an then go for the original.